For as long as she can remember, a hockey rink was a like a second home to Michele McDonald. 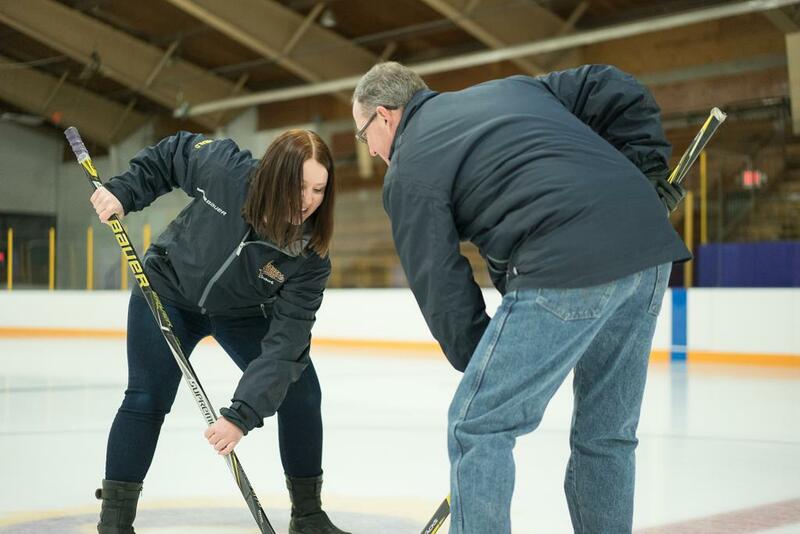 Whether she was on the ice for practices or games, or cheering on her hometown International Falls Broncos, if she wasn’t actually at her house – conveniently located between the city’s two arenas – she was usually at a rink. It just comes with the territory when you’re a player, and when you’re the coach’s daughter. But Michele didn’t just pick up the hockey bug from the rink. She picked up the coaching bug, too. Following in her dad, George’s, footsteps, father and daughter now make up the Falls High School varsity coaching tandem; Michele in her first year at the helm of the girl’s team and George in his fourth year as head coach of the boy’s squad. George’s coaching career began once his playing career ended. Shortly after graduating college he took his first teaching job in Bemidji in 1988 with an assistant coaching job at Bemidji High School included. George taught and coached for three years in Paul Bunyan’s neighborhood before the opportunity to move back home to International Falls came about. Coaching, of course, was a part of the allure and in 1993 he was on the Bronco bench as an assistant. But with Michele on the ice as a young player, George noticed he missed celebrating her hockey experience. Michele made sure it was worth watching. 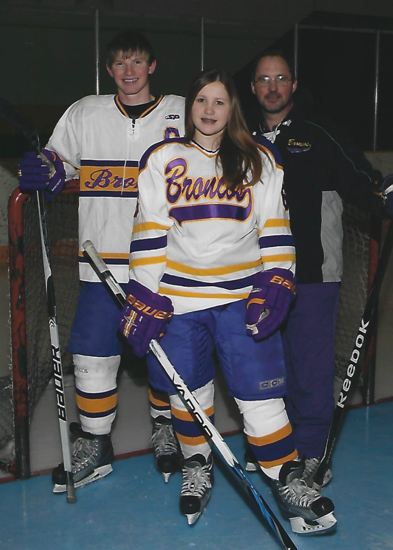 In four years she scored 31 goals and tacked on 40 assists for the Broncos. It was an extra homage to her dad, who, naturally, was Michele’s favorite coach growing up. It’s hard not to talk hockey in a hockey family. That can be especially hard in a hockey family with two coaches. But the McDonald’s try to make a conscious effort to table game plans when they can. “When she was younger, she saw me come home from a tough loss and how I didn’t really want to talk hockey too much after that. Now she really understands that,” said George. They do find time to talk shop when they’re at work however. Both Michele and George teach special education classes at Falls High School. When they can carve the time out to grab lunch together, they do. 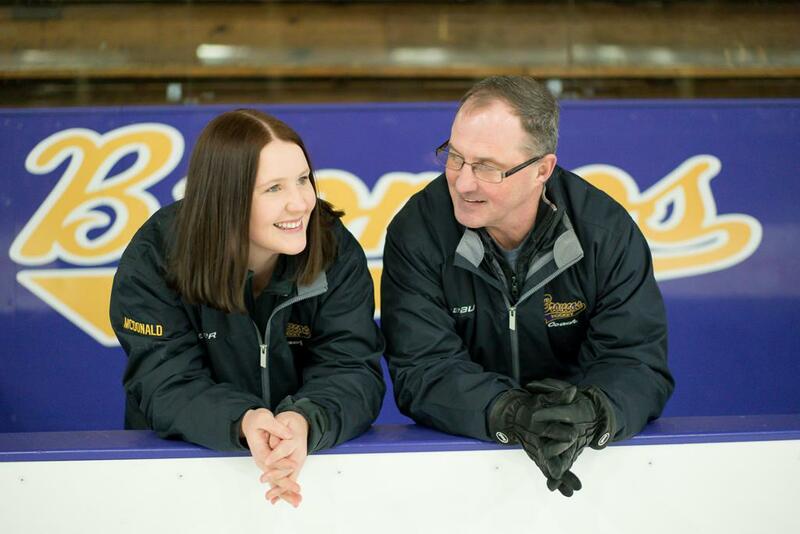 It provides each a time to catch up with one another, and provides Michele the perfect opportunity to pick her dad’s veteran coaching brain as well. “We’ve always talked hockey but it’s fun now to sit down and think about plays or if I’m stuck on something I can ask him for help or say, ‘Hey we are doing this well, can we extend off of it?’ That kind of stuff,” Michele explained. George’s biggest piece of coaching advice? “A lot of people look at coaching and it looks like so much fun, and it is, but my first piece of advice to her was that there is a lot of things that people don’t see that you have to do behind the scenes,” he said. “With high school sports there are a lot of responsibilities off the ice. Michele is the same as I am in wanting a team to be good students in school and be responsible outside of school, outside of the rink. 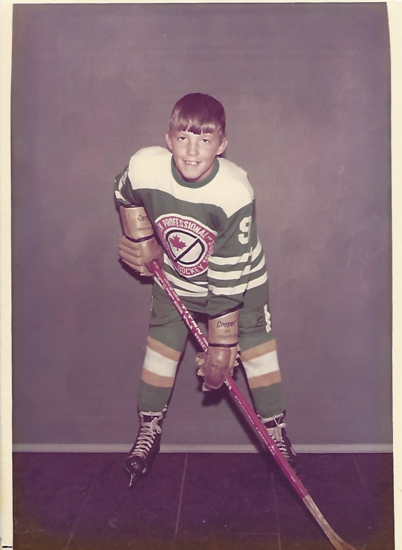 International Falls was once a true powerhouse on the ice. Between 1950 and 1975 the Broncos made 14 state tournament appearances, eight finals and captured six tournament championships including three straight in 1964, 1965 and 1966. The borderland town lays claim to three U.S. Olympians (Richard Dougherty, 1956 silver medal; Mike Curran, 1972 silver medal; Tim Sheehy, 1972 silver medal) and countless high-end coaches (Dean Blais, Kevin Constantine, Bob Mason) along with minor and pro league players (Gary Sampson, Neil Sheehy). But as distinctly as the temperatures rise and fall on the state’s uppermost edge, the numbers within the northern hockey program also tend to fluctuate. During the 2010-11 season there were 214 players ages 8-14 registered in International Falls Hockey. In 2017-18 there were 156. The boy’s numbers have managed to find consistency, garnering between 130-150 players each year. The girl’s however have been as high as 75 (2010-11) and as low as 12 (2017-18). “It can be hard, sure,” said Michele, whose varsity team is made up of 12 junior varsity and 12 varsity-leveled players. “But this year we have a 12U team that we didn’t have last year, so that’s pretty exciting to see. We’re building on that and we know it’s going to be up and down, but I look at like, this is the 25th year of girl’s high school hockey, and I’m 24 so girl’s hockey was just starting to shoot up when I was younger—when there were just a couple girls even playing. George beams with pride at his daughter’s passion and eagerness to coach the next generation. Together the McDonald’s hope to restore Bronco hockey to its early successes, celebrating the successes of one another along the way.